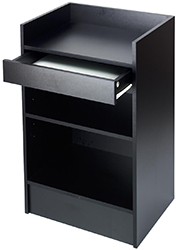 Looking for a useful stand that will fit in any retail environment? 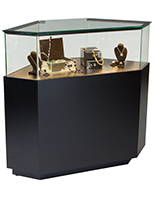 These counters and cash wraps measure 44” wide or less and can be placed alone or with another displays to create a point of sale configuration. This type of fixture is great for any department store, jewelry shops and other commercial establishments. 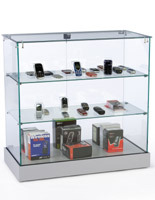 Retail display cabinets of this size are ideal for outlets that need to save floor space or just have a smaller space to fill. 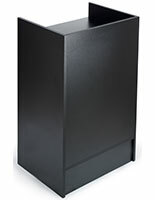 Counters and cash wraps are available in three styles to meet any need. 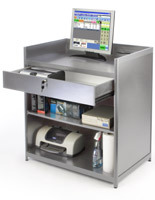 Fixtures with a “register stand” design make ideal workstations because they can hold a cashbox and other supplies. 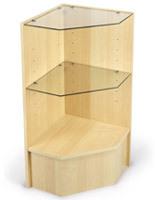 These can feature a drawer for extra storage space or a front display area for showcasing merchandise. 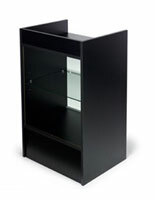 Corner units are great for accenting commercial display cases configurations or for sitting against walls. 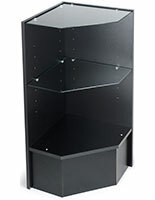 These can merchandise wares in an open or enclosed design with a single area or multiple shelves. 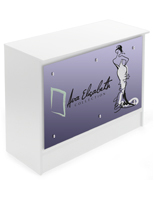 Also available are simple rectangular display cases that feature a full view design. These can be placed with other fixtures or in the center of the room because they make goods stand out. Counters and cash wraps like these feature a strong construction that will withstand any high or low traffic retail environment. 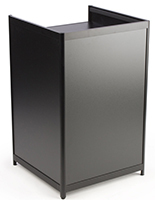 Each model features a frame or base made of aluminum, particle board or medium density fiberboard. 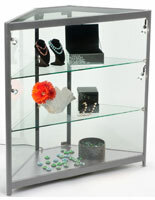 In addition, each display unit is made with tempered glass that is treated to be four to five stronger than normal glass. 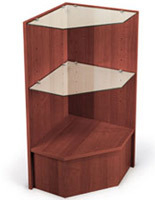 Retail display cabinets are available in a number of attractive finishes including black, silver, maple, wenge and cherry to fit with any décor. 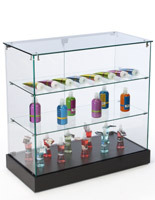 Rectangular commercial display cases feature a frameless design that has (4) tempered glass sides and a clear countertop. 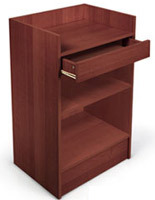 They also have a locking door for protecting valuable merchandise from tampering or theft. 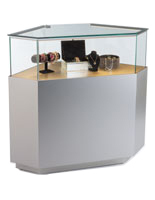 With their smaller size, these counters and cash wraps are excellent fixtures for fitting into any retail display. 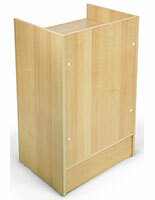 Larger stands and full configurations are also available for purchase for retailers that wish to fill more floor space.